Building homes, shelters, and survival bunkers from recycled shipping containers is a very economical and efficient way to build your home. Some people balk at the idea of living in a shipping container home, but if designed correctly, and smartly, you can design a home which is indistinguishable from traditional homes. A little bit of creativity, paneling, flooring, and siding, and from the street you’d never be able to tell that a container home is made from large steel modular boxes. Another very powerful incentive for creating your home from shipping containers is strength. Your home will be made from steel! If designed properly, a container home is practically earthquake and nature proof. Much stronger than stick built homes, and in some cases, stronger than brick or stone homes. Container homes are also very energy efficient in almost any environment with some creative and inexpensive design. Shipping containers are the perfect choice for Off The Grid building and living! Shipping container homes are the PERFECT base to start building your off grid home or cabin. It’s extensible, affordable, modular, and portable. If you build a traditional home or cabin, and ever have to move, you can’t take your home with you, which forces you to sell it and start from scratch. With container homes you can easily upgrade an existing home by simply adding another 40′ container, which adds an instant 320′ square feet onto your total living space. 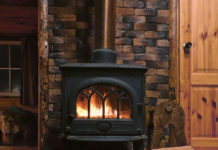 It’s inexpensive, it’s efficient, and it’s eco-friendly. 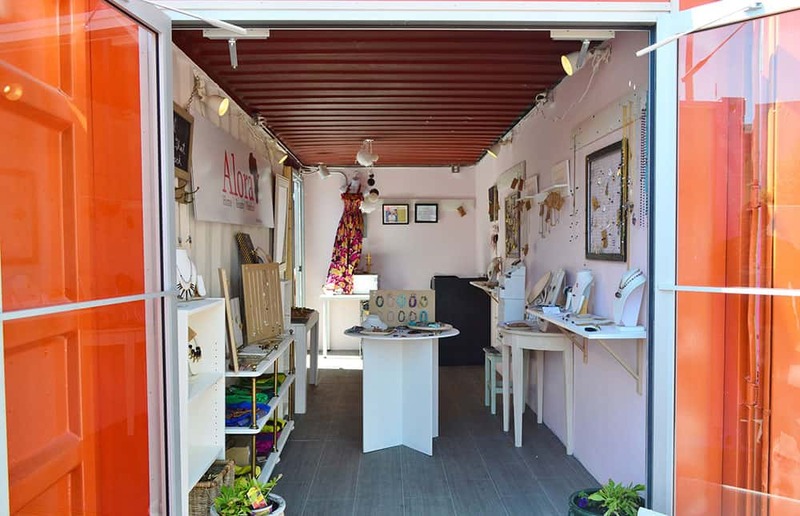 When you turn a used shipping container into a home, you’re helping contribute to the betterment of the world. These are a just few of my shipping container home designs. From one extreme to the other, cheap and small, to extremely large and extravagant these are some of the most popular home design styles made from shipping containers. 1280 square foot ranch style home for less than $10,000 in materials. This design, like most others I’ve designed, uses a minimalist approach to maximize livable floor space. The design is so simple, it uses just two ISO shipping containers spaced 16 feet apart to form a grand entrance and living room/dining room space which is 640 square feet, with 12 foot vaulted ceilings. The two containers off the each side form the outer walls, and contain the bedrooms and bathroom. It’s not shown, but you could take and cut out half of the inside wall of one of the containers and form a very big kitchen, which opens into the the dining room/living room common area, basically giving the whole place a very big “feel” inside. The addition of the large glass wall in the back is simply to give it a more open feel. Here’s a view of the inside 12 foot vaulted ceilings. Notice how much more room there is inside. Really this is the whole idea. Technically, I could add another 8 feet to the width and increase the common area floor space by 33% to 960 square feet, but that would increase costs by $3000-$5000 more in materials. The rear of the house doesn’t have to be a glass wall, but I like it because it just looks nice, and will give the interior space a large feel opening onto the back patio. I’m not sure you could get much more space for the money using only two containers. 1280 square feet is a good size to start out, and even if you were to splurge a little with more expensive materials you could double the cost to $20k and still have one very affordable, and very nice, home. Spread the containers apart just 8 more feet and you increase the square footage to 1600 sqft. Not too shabby for $20k, huh? Throw in another $5000 for a small solar panel system and you’re ready to go. Here’s a highly modified version of my previous shipping container home design, with the addition of a 16′x40′ and a 10′x32′ sun/viewing deck on the top of the home. This adds 960 square feet of patio/deck space to the home. Pretty good for two tiny shipping containers. Notice the solar panel array on the southern side of the home. The bottom back glass wall faces west to catch the afternoon and evening sun, and the top deck is for viewing those beautiful desert sunsets over the mountaintops. Adding more windows to the south facing side of the home will also capture more of the sun’s energy. I’m not sure is this is a good thing in the desert, but, it’s probably good in colder climates. 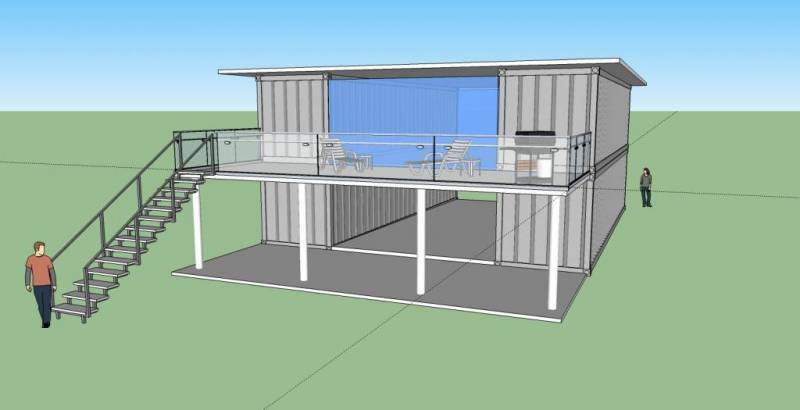 This is a more complex design than my first $10k 1280 Sqft Ranch Style Container Home using two shipping containers, however the cost of extra materials to complete the railing, upper decks, and extra structural materials needed to support the added weight should still have this shipping container home coming in under $40k including the solar panels. (2560 square feet = $9.77 per square foot): This one (with a sloped roof). Simplistic, inexpensive and minimalist is the point. 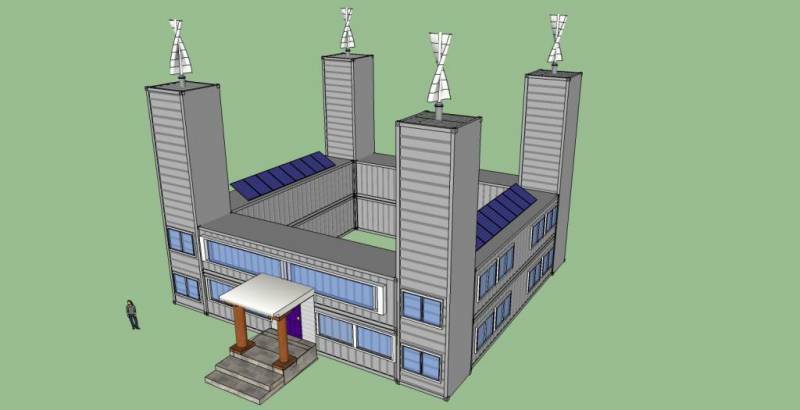 Since the building parts/materials cost are kept to a minimum, the idea of course is to maximize the emphasis on solar and wind power systems for off the grid living. Making the roof flat allows the space to be used for the power system array, OR it can be the base for a third story later, which would cost no more than about $10k (2 containers + flooring/roofing materials) to add to the home, thereby increasing the square footage by 1280 square feet from 2560 to 3840 sq ft. This can add as many as 5-6 more rooms onto the home very inexpensively. Structural integrity is preserved, and actually strengthened by adding another level. 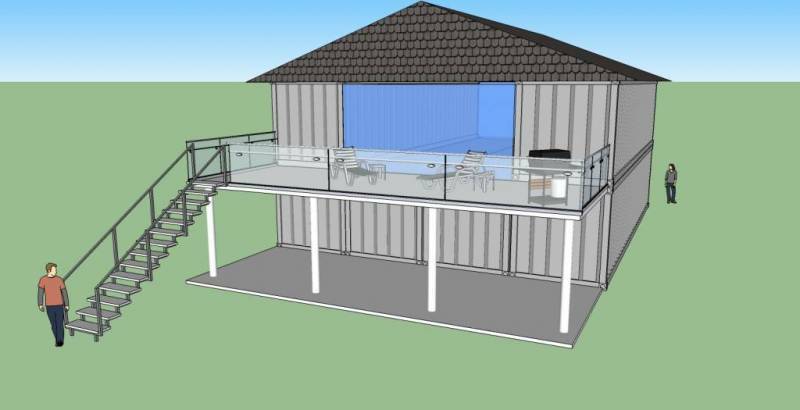 The back deck is approximately 31’x12′ = 372 sq ft, as is the 1st floor patio, for a combined square footage of recreational space of 744 sq ft.
(STRAWBALE/MUD PLASTER INSULATION LAYER): Here’s a very basic draft of the concept I had. Strawbale over shipping containers, with mud/plaster/stucco over that. This is “double” insulated and provides probably more than 40-50 R value. This means you can probably place these in the desert anywhere in the world and still stay cool in 100-120 degree heat. Assuming you could find them again, you’re looking at about $22,500 for all 9 containers. Pretty cheap considering that’s a total of 2880 square feet of floor space. The strawbale will be about $5 per bale and we’ll need about 200, so $1000 for the strawbales. This is well under the $50k minimum and the $100k maximum budgeted for this project. This leaves $18,650 to purchase/build the solar and wind combo system. And $50k for the land. If you shop around you can buy an acre or more of land for about $30k-$40k here in southern California. Not bad for a 3 story 3000 square foot house… This is cutting it close, and we can fine tune these numbers, but this whole system is very doable for under $100k. The next (ISBU) shipping container home are three designs for a “Container Castle”! The first design is small 2 story, but the second is a 3 story, and the 3rd is a massive Container Castle at nearly 10,000 square feet with at least 8 bedrooms, 4 bathrooms. All have 4 large helix wind turbines and a solar panel array. This is my completely NEW Container Castle design. 4 Stories, consists of 18 40′ shipping containers forming a ring around a central atrium like vertical space 32 feet tall by 40×40 (1600 sqft) wide in the center. The four stories total a square footage of 5120 sqft not counting the 4 40′ towers at each corner of the castle. Each tower level has a floor space of 64 sqft, for a total of 1024 square feet within all 4 towers. There is a 10 foot round dome skylight on the roof which lets in plenty of sunlight to grow many species of plants and even trees INSIDE the castle. 4 large helix wind turbines and a solar panel array with 48 solar panels generate a combined power of 44,000 watts. $226k CONTAINER CASTLE MODEL: And the final, nearly 10,000 square foot 8+ bedroom Container Castle. Then I decided I wanted something smaller and more economical. So I tried to keep costs below $25k for this next 2 story 2560 square foot Container Home. The primary idea of course being affordability and simplicity, plus the added benefit of a good sized 3 bedroom home design. $25k CONTAINER HOUSE MODEL: 3 BR 2 Bath – 2560 square foot Container House. All foundation, wiring, and plumbing is done by homeowner. Front and rear walls can be built for less than $1000 worth of lumber and materials. This encloses the living room/kitchen area, which is 960 square feet. Flooring/Wall covering will be scavenged remnant/recycled materials, or purchased at manufacturer cost. Outer walls will be strawbale/mud plaster for an insulation R value of about 50. Keeps it cool in the desert heat. PRICE: Approximately $25,000-$35,000 (not including water well, heat/ac, or the solar/wind power systems). 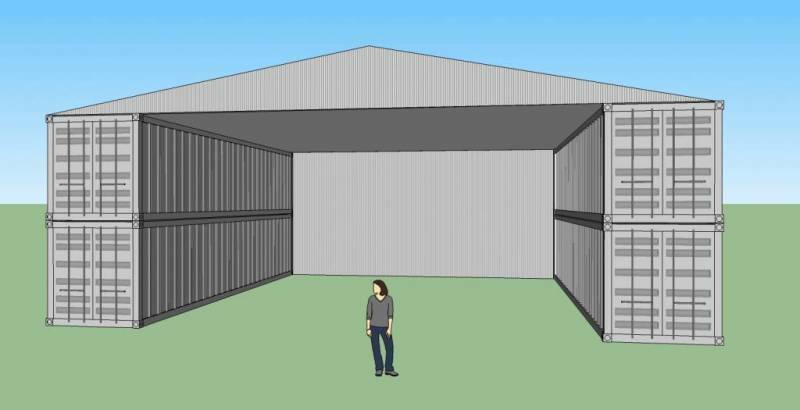 $25k CONTAINER WAREHOUSE WORKSHOP MODEL: And finally… What would all this be without a place to design and fabricate all of these shipping container homes? Here’s a Container Warehouse/Workshop I designed with space and simplicity in mind. This 2720 square foot workshop could be built for about $25,000 including foundation, roof, and electrical. Not too bad, and LOTS of space to work. Only needs tools and equipment! Here is a simple yet practical design I made that accents the simplicity of the shipping container, yet is paneled and sided such that it’s indistinguishable from a traditional contemporary home design. In other words, you can’t tell it’s made from two shipping containers. This unit is complete with Solar Power and a Atmospheric Water Generator to supply drinking water and power. This next design is a spin on the above design, but with a sun deck and sliding glass door atop the ground floor. This contemporary unit has everything the first has, and the addition of an additional 160 square foot sun deck. These two designs are easily upgradable. Well, that’s it for now. Hope you enjoyed them. 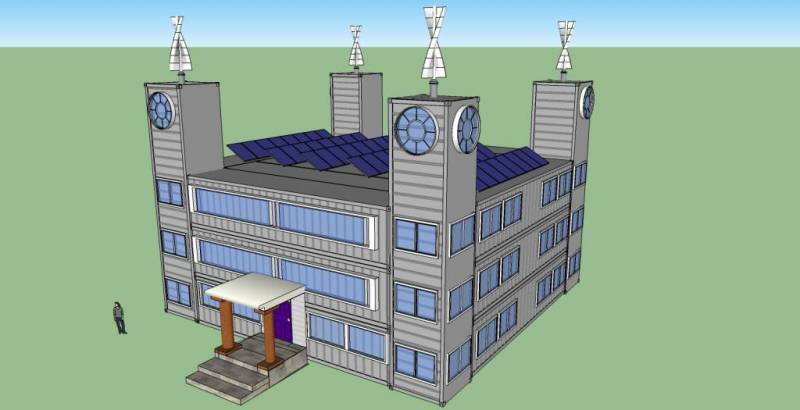 The 3D images were created in Google Sketchup. Comments suggestions and opinions encouraged. Disclaimer: These are 3D design concepts for shipping container homes. They’re only a design concepts, and they do not exist, and are not for sale. The pricing presented here are for BARE BONES materials, does not include freight, moving, crane rental, or any amenities. Anyone is welcome to use this design under an Open Source Creative Commons Share and Share Alike License, with credit given to this page. Some very good ideas here for inexpensive housing off grid or on grid. Shipping containers are built strong to be stacked, this gives them great structural strength for the type of buildings you have pictured. Insulating them is a must, but not hard to do. They are also air and water tight, which means that ventilation must also be considered. Have you found out about the permitting on the shipping container homes? Permitting is different county by county, and state by state. I think as long as the structure meets national, electrical, plumbing, and structural codes that simplifies things when applying for permits in local counties and communities. I am interested in designing a 3 story tower style addition to a farmhouse. The tower could be 6 20ft. Containers stacked with an observation deck on top. I was searching the net to see if someone had been working with containers on similar ideas… Very cool stuff! The problem with container homes, is the same for all the others. You’re not going to come in at your price points, as you’ll need a structural engineer and a welder. Once you start cutting holes in the skin, the container loses it’s integrity. You can’t just stack them like legos, they will need to be reinforced. For that reason, while it’s a neat idea at first glance, building stick will end up cheaper. Structural engineer and a welder, and many other skilled people are already taken care of and factored into the price. YES, we’l certainly be able to come in around our price point unless the permits and licensing is more expensive, and that all depends on the county where we purchase the land. You are wrong about cutting the skin causing a reduction in the strength of the containers, they have a frame that runs the length of all the corners. Only the edges of the containers are load bearing. A decent plasma cutter/arc welder combo can be purchased from ebay for $700 and non structural welding can be picked up by anyone in very short period of practice. Clamps are typically used to connect the containers when they are stacked. The biggest issue is coming up with a suitable insulation plan for the designs. Here is a simple, but a little bit of an expensive solution to the insulation problem. Purchase a Reefer (insulated shipping container) that has the added bonus of stainless steel interior walls, for about 6K each. Hi, I have a few ideas of my new home, but lack the ability to construct a design as elaborate to that of yours. I have a plot of land, approx 450 sq/m. My idea consists of having a 2/3/4 storey designer home, for my big family of 20. .. 6 Big Master bedrooms. .. 6 Medium Master bedrooms. .. and 8 Medium rooms with two rooms to a bathroom. .. I have a rough idea, of what I want the bottom floor to be like, in my drawings. Could you design a home for me? I am more than willing to pay for your designs, whatever the price. 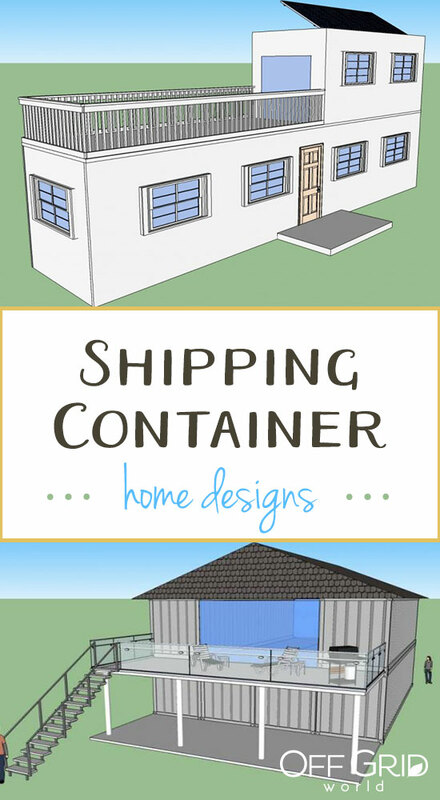 Do you have any shipping container design plans using only a 20 feet container? Where can I find these type of plans? Do you build these units are just supply the plan ideas. I live in Florida and about to purchase a piece of land and would love o have one of you designs built for my family. Is it possible to extend the two containers apart to have 2000-2300 sq feet. I want to build a 3 bedroom and 2.5 bathroom. I want to stay on one level. 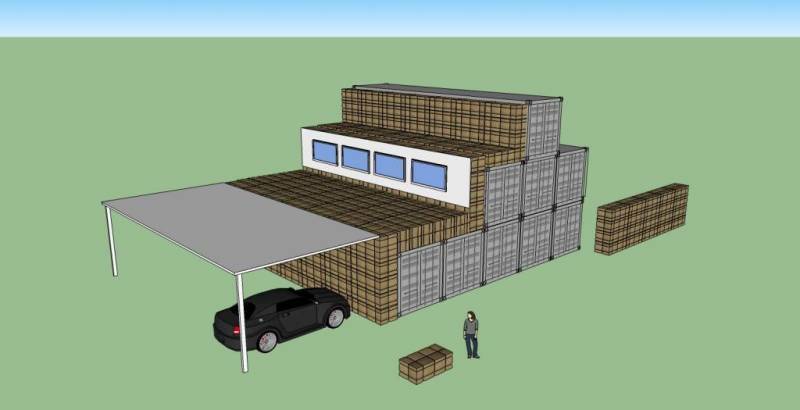 Yes, the containers can be separated a bit more to create more floor space, you’d have to reinforce the containers a bit more to support the added weight of the extra roofing materials. Keep in mind, any added materials are going to add to the cost of the unit. I really appreciated the chance to look at your ideas here. They are novel and practical at the same time. It’s the right kind of out-of-the-box thinking. I had a question for you: do you know anyone that has actually built one of your castle designs? If so, I’d like to get more information. Can you share the Google SketchUp files??? I would like to use them to create my own layout. I’m currently looking at a design consisting of three 40′ units to replace an existing house on my property in rural Victoria county, Texas. Right now I’m doing cost estimates to see how much I need to budget. My question is: how did you arrive at the construction figures you present under the container castle design? Did you use RS Means, the square foot costbook, or something else? what about using containers for living underground? I have the land already. On a budget of 40 to 45,000 do you think that is possible? Thinking of a 3 bedroom 2 bath home. Fantastic ideas. How do we contact you for a design?